No, not a crossword clue, but literally true. 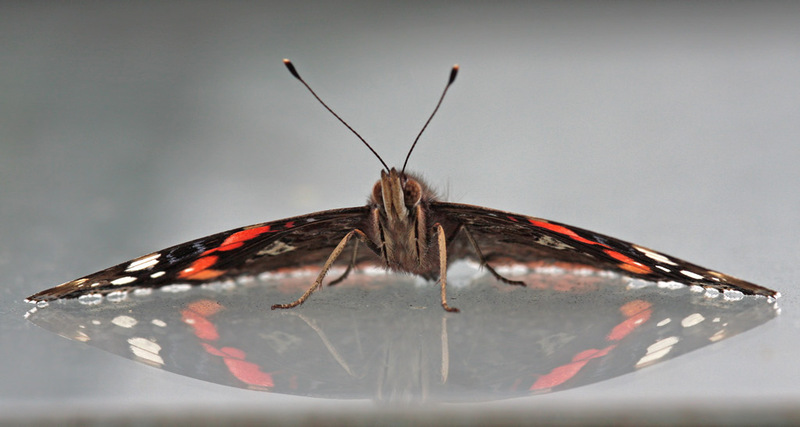 A red admiral butterfly resting on my greenhouse roof. Shot at head height face on, standing on it's own reflection in the glass of the roof. The pale background comes from the shading material on the inside of the roof. Canon EOS 40D, Sigma 105mm F2.8 macro, 1/400 at F9.0. Stunning reflection and perspective. Congrats and well deserved. Excellent work and shot !! Very interesting and inspirational setting for the subject. I've not had anything like this success in using glass backgrounds. Instead, I usually pick up a lot of dust on the glass (typically just an ordinary, nominally clean sliding glass door or window). Also, the exposure is difficult to meter using the camera's normal metering systems - the degree of flash depends very critically on the angles involved, as one would expect. Yet I'm newly motivated by your success and now hope to figure out how to achieve something like this effect at least somewhat repeatably.